12/08/16 -- Soycomplex: Beans closed lower, but not by much. The USDA surprised the trade with a 48.9 bu/acre national average soybean yield and estimated production at 4.060 billion bushels. The trade was anticipating a national average soybean yield of 47.6 bu/acre and US production of somewhere between 3.865 to 4.054 billion bushels. Apart from that change to the global supply and demand balance sheet most other items of note were left unchanged, with production in Brazil (103 MMT) and Argentina (57 MMT) unchanged along with imports (87 MMT) from China. World ending stocks were however raised more than 4 MMT to 71.2 MMT. The increase in US production more than offset a rise in their exports in 2016/17 to 53 MMT and ups ending stocks 1 MMT to 8.9 MMT. Aug 16 Soybeans settled at $10.03 1/4, down 19 cents; Nov 16 Soybeans settled at $9.81 3/4, down 2 1/4 cents; Aug 16 Soybean Meal settled at $332.90, down $1.00; Aug 16 Soybean Oil settled at 31.90, up 19 points. For the week nearby Aug 16 beans were down just 1/2 cent, Aug 16 meal was $2.90 lower and Aug 16 oil was up 138 points. Corn: The market closed around a cent higher having been 9 cents lower at one stage. The USDA report came in bearish for corn, raising the 2016 average US corn yield to 175.1 bu/acre, with production at a record 15.153 billion bushels. Argentine 2016/17 corn production was raised from 34 MMT to 36.5 MMT and world production was upped from 1010 MMT to 1028 MMT. Glocal consumption was increased also, up from 1009 MMT to 1017 MMT, but ending stocks still rose to 220.8 MMT. The USDA have America taking a larger slice of the global export cake in 2016/17 at 55 MMT versus 52 MMT previously. Brazil's share will drop 1 MMT to 19.5 MMT, although Argentina's will rise 0.5 MMT to 23.5 MMT, they predicted. The weekly Commitment of Traders report showed managed money adding another 32,645 contracts to their net short position taking that up to -137k lots. Sep 16 Corn settled at $3.22 1/4, up 1 1/4 cents; Dec 16 Corn settled at $3.33, up 1 1/4 cents. For the week Sep 16 corn was down 2 cents. Wheat: The wheat market closed higher. The USDA raised US all wheat production to 63.2 MMT from 61.5 MMT previously and sees 2016/17 exports up from 25.0 MMT to 25.5 MMT. European production was dropped 9 MMT from last month to 147.5 MMT. However increases from Russia (up 7 MMT to 72 MMT), Ukraine (up 2 MMT to 27 MMT), Australia, Canada and Kazakhstan all countered the lower EU output to put the world crop almost 5 MMT higher this month at 743.4 MMT. Consumption is seen up 3 MMT to 723.5 MMT. Ending stocks were lowered nearly 1 MMT from 253.7 MMT to 252.8 MMT but still remain at record large levels. EU exports were cut from 34 MMT to 27 MMT, and Russia's raised from 25.5 MMT to 30 MMT, making them the world's leading supplier of the grain. Sep 16 CBOT Wheat settled at $4.22 1/2, up 6 1/4 cents; Sep 16 KCBT Wheat settled at $4.16 1/4, up 4 cents; Dec 16 MGEX Wheat settled at $5.16, up 6 1/2 cents. For the week overall, Chicago wheat ended with net gains of 6 1/2 cents, Kansas wheat was up 4 1/2 cents and Minneapolis added 13 1/4 cents. 12/08/16 -- EU grains finished lower on the day and mixed for the week. London wheat consolidated from a more than one-year high hit yesterday, although sterling weakness continued today. The day ended with Nov 16 London down GBP0.65/tonne at GBP130.75/tonne, Sep 16 Paris wheat was EUR3.25/tonne lower at EUR164.50/tonne, Aug corn was down EUR1.25/tonne at EUR165.25/tonne and Nov 16 rapeseed was down EUR0.25/tonne to EUR369.50/tonne. For the week London wheat was still GBP3.75/tonne firmer, Paris wheat was down EUR2.00/tonne, corn was up EUR0.25/tonne and rapeseed added EUR3.25/tonne. The pound closed around 1.1550 against the euro - a level last seen in August 2013. It also now sits comfortably below the 1.30 level against the US dollar. The UK winter barley harvest is now 90% done with yields averaging 5.9-6.3 MT/ha, say the HGCA. That's 7-13% below the 5-year average of 6.8 MT/ha. Winter OSR is 80% harvested with yields coming in around 3.0-3.2 MT/ha, some 12-17% below the 5-year average of 3.6 MT/ha, they add. 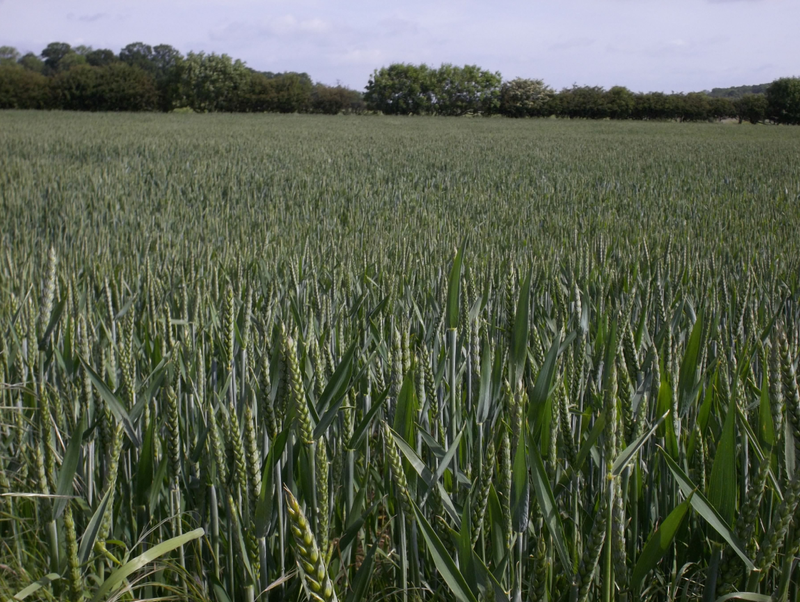 Only around 5% of the winter wheat has been cut, and it's therefore too early to call yields reliably this year. However what has been cut is turning in some better ones than expected. "In the Eastern region and South East, early yields were 10% above the farm average, with farm yields typically between 8.7-8.9 MT/ha. Whilst farm yields are close to average in Yorkshire and Humber, West Midlands and South West, typically yielding between 7.3-8.0 MT/ha. In the East Midlands, the earliest yields were slightly below the farm average," they said. 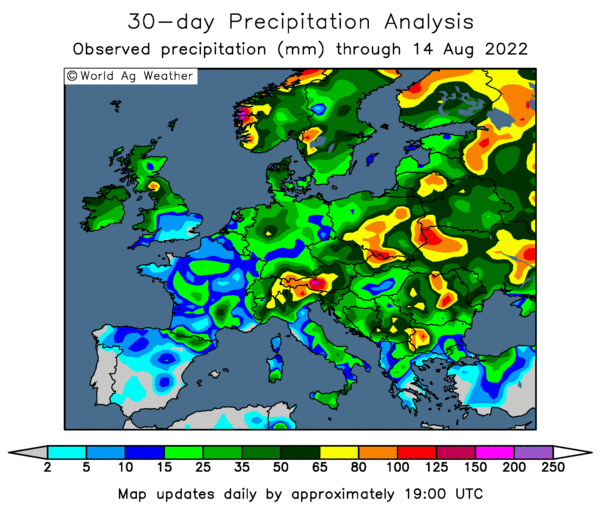 It would seem thus far then that UK wheat yields may not be suffering as badly as some other crops this year, we will need a bit more time for clarification of this though. EU soft wheat export licences came in at 450 TMT this week, with the cumulative season-to-date total 2.2 MMT versus 2.3 MMT this time a year ago. FranceAgriMer said that the French wheat harvest is 76% done versus 62% a week ago and 95% complete this time last year. Spring barley is 78% harvested versus 47% last week and 97% a year ago. They said that 96% of the French corn crop is now silking as opposed to 83% last week and 100% a year ago. French wheat crop conditions were cut another 2 points in the good to very good rating to just 33% (77% a year ago). Strategie Grains said that only 79% of this year's French wheat crop will make milling standard as opposed to 88% a year ago. Across Europe it's 66% versus 71% a year ago. Jordan issued a new 100 TMT feed barley tender. Saudi Arabia issued a tender to buy 600 TMT of hard wheat for Oct/Dec shipment. 11/08/16 -- Soycomplex: Beans closed a little it firmer heading into tomorrow's WASDE report. Weekly export sales came in at 308,000 MT for 2015/16 and 2,792,200 MT for 2016/17. China took a whopping 1,844,000 MT of the new crop along with unknown destinations booking 743,000 MT. Exports of 1,074,200 MT were up 49 percent from the previous week and up noticeably from the prior 4-week average, with China taking almost half. The trade is talking a 47.6 bu/acre yield estimate from the USDA tomorrow, but given the current rate of export interest that might need to be even higher. The USDA also reported 120,000 MT of new crop sales to China and 129,000 MT to unknown under the daily reporting system. Aug 16 Soybeans settled at $10.22 1/4, up 5 1/4 cents; Nov 16 Soybeans settled at $9.84, up 1 3/4 cents; Aug 16 Soybean Meal settled at $333.90, down $2.30; Aug 16 Soybean Oil settled at 31.71, up 21 points. Corn: Corn closed slightly lower. Weekly export sales of 594,900 MT for 2015/16 were up 80 percent from the previous week and 34 percent from the prior 4-week average. New crop sales of 1,015,600 MT were in line with expectations. Exports of 1,444,200 MT were up 27 percent from the previous week and 16 percent from the prior 4-week average. The trade is expecting a US corn yield of 170.6 bu/acre on average in tomorrow's report, although at least one pundit is as high as 175 bu/acre. China offered another 3.2 MMT of corn stocks for auction but only sold 214 TMT of those. Dr Cordonnier said that Brazil is looking at allowing 1.5 MMT of US GMO corn into the country tax free to help the domestic livestock industry cope with local prices said to be close on $7/bu. Sep 16 Corn settled at $3.21, down 1 1/2 cents; Dec 16 Corn settled at $3.31 3/4, down 1 1/4 cents. Wheat: Wheat closed firmer. Weekly export sales came in a better than expected 607,600 MT for 2016/17, up 86 percent from the previous week and 49 percent from the prior 4-week average. Exports of 405,800 MT though were down 30 percent from the previous week and 11 percent from the prior 4-week average. 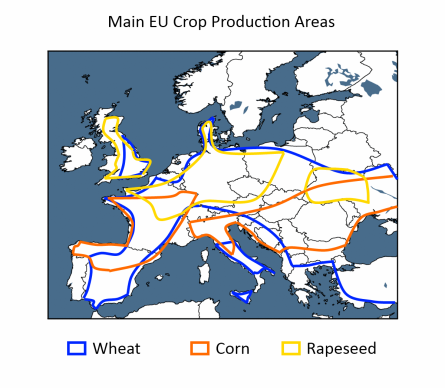 The EU crop is getting smaller, and not in dribs and drabs either. So too are export prospects from the region. Strategie Grains cut their latest estimate for the soft wheat crop by 7.7 MMT to 137.9 MMT, mainly due to losses in France where production was pegged at 29.9 MMT, down 6.0 MMT from last month and 11.1 MMT on last year. They also took a serious slice off their prediction for EU soft wheat exports in 2016/17, down 4.3 MMT to 24.7 MMT. The trade will look with interest to see how the USDA addresses the issue tomorrow. Sep 16 CBOT Wheat settled at $4.16 1/4, down 5 1/2 cents; Sep 16 KCBT Wheat settled at $4.12 1/4, up 1/2 cent; Sep 16 MGEX Wheat settled at $5.03 1/2, up 2 1/4 cents. 11/08/16 -- EU grains closed mostly firmer, with London wheat marching on to new highs. The day ended with benchmark Nov 16 GBP1.40/tonne higher at GBP131.40/tonne. Sep 16 Paris wheat traded up EUR1.00/tonne at EUR167.75/tonne, Aug corn was EUR1.00/tonne higher at EUR167.00/tonne and Nov 16 Paris rapeseed was EUR0.25/tonne lower at EUR369.75/tonne. Nov 16 London wheat closed at the highest level for a front month since Jul 9, 2015, and new crop Nov 17 closed at it's best levels since last October. The pound finishing at it's worst levels against the euro since Aug 2013 was certainly a contributory factor, as well as the constant downgrading of the French crop and a bleak outlook for 2016/17 wheat exports from them. The weak sterling, triggered by the Brexit vote, helped UK wheat and barley exports in 2015/16 exceed Defra expectations, noted the HGCA. This was due to a late surge in sales - wheat exports in June were 276 TMT, a 19-year high for the month, and barley exports were 105 TMT. Total season shipments finished up at 1.99 MMT for barley and 2.85 MMT for wheat, according to Defra. Sticking with them, they said that the English wheat planted area for the 2016 harvest was 1.699 million ha, slightly above the 1.693 harvested in 2015. Barley area jumped from 748k ha to 798k ha. The rapeseed area fell more than 10% to 546k ha. In Europe, Strategie Grains cut their latest estimate for the soft wheat crop by 7.7 MMT to 137.9 MMT, mainly due to losses in France where production was pegged at 29.9 MMT, down 6.0 MMT from last month and 11.1 MMT on last year. They also took a serious slice off their prediction for EU soft wheat exports in 2016/17, down 4.3 MMT to 24.7 MMT. Separately CRM AgriCommodities pegged French production at 28-29 MMT, and the German crop at 22.5-23.0 MMT. For the UK where the harvest is only just getting going, CRM go 14.5-14.7 MMT, with Strategie Grains slightly higher at 14.8 MMT. 10/08/16 -- Soycomplex: Soybeans closed lower but off session lows in light consolidation trade. We have the all important USDA report coming up on Friday, and today broke the back of the 10 straight day run of sales reported to China/Unknown for US soybeans by the USDA under the daily reporting system. In short, the bulls didn't get fed, and decided to take some money off the table. A Bloomberg survey shows the trade expecting a national average soybean yield of 47.6 bu/acre. US production is seen somewhere between 3.865 to 4.054 billion bushels. Brazil's real is at a 1 year high versus the US dollar, further ruling out competitive offers out of there, Trade estimates for tomorrow's weekly export sales report are strong at 200,000 to 400,000 MT on old crop and 1.9 to 2.5 MMT on new crop. 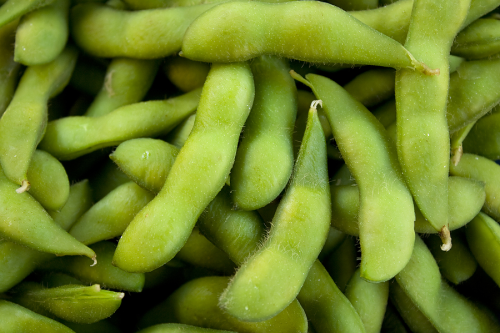 Aug 16 Soybeans settled at $10.17, down 5 cents; Nov 16 Soybeans settled at $9.82 1/4, down 5 3/4 cents; Aug 16 Soybean Meal settled at $336.20, down $3.00; Aug 16 Soybean Oil settled at 31.50, up 33 points. Corn: The corn market closed virtually unchanged. 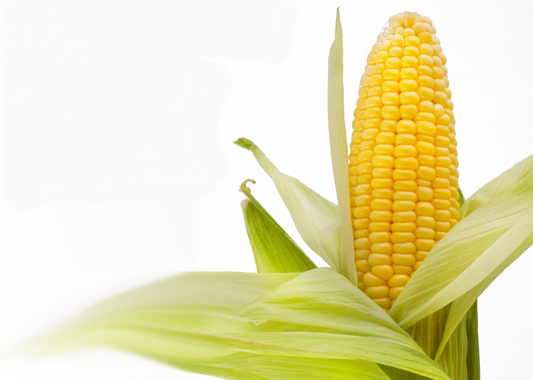 Mexico bought 143,650 MT of corn for new crop delivery under the daily reporting system. A Bloomberg survey has the national average yield at 170.6 bu/acre pencilled in for Friday's report and total production at 14.772 billion bu. The USDA were at 1698 bu/acre and 14.54 billion bu in July. There's no real shortage of world feed grains, but there is a greater emphasis on the US to supply global needs this year, with lower production in South America. Trade expectations for tomorrow's weekly export sales report see corn sales at 1.0 MMT and 1.5 MMT for both marketing years combined. Weekly US ethanol production was up 14,000 barrel/day to 1.018 million barrels/day. Sep 16 Corn settled at $3.22 1/2, up 1/4 cent; Dec 16 Corn settled at $3.33, up 1/2 cent. Wheat: The wheat market closed higher. Traders are still assessing the French situation. Freight reports suggest that Glencore are in the market to cover a 35,000 MT cargo of Romanian wheat into France. Syria bought Russian wheat and Israel purchased optional origin wheat. Ukraine's wheat harvest is almost done for another year at 97% complete. Russia's is yet to reach halfway. Weekly export sales tomorrow are called in the 350,000 MT to 550,000 MT region. Friday's USDA report might bring increased production estimates for the US, Australia and Russia. Europe will doubtless be marked lower. How they balance reduced output (and most likely therefore exports) in Europe with the rest of the world will be of interest. Sep 16 CBOT Wheat settled at $4.21 3/4, up 4 3/4 cents; Sep 16 KCBT Wheat settled at $4.11 3/4, up 1 3/4 cents; Dec 16 MGEX Wheat settled at $5.08 1/2, up 1 cent. 10/08/16 -- EU grains closed mostly higher, with benchmark Nov 16 London wheat closing at the best levels on a front month since Jul 15. At the close Nov 16 London wheat was up GBP1.75/tonne at GBP130.00/tonne, Sep 16 Paris wheat was up EUR1.75/tonne to EUR166.75/tonne, Aug Paris corn was up EUR1.00/tonne at EUR166.00/tonne, Nov 16 Paris rapeseed was EUR1.25/tonne lower at EUR370.00/tonne. Ship brokers report that Glencore is looking to fix a 35,000 MT cargo of Romanian wheat to France, confirming earlier rumours. Whether this is to bolster quality, or simply make up for this year's volume shortfall is unclear at the moment. 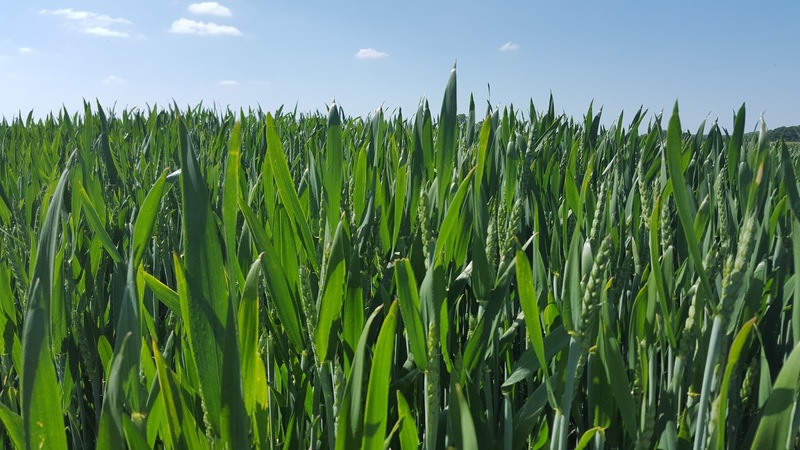 Some reports out of France suggest that protein levels and specific weights this year are generally within contract tolerances, even if yields are dramatically reduced. 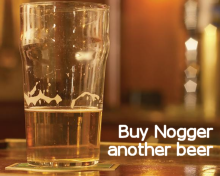 There's no word yet on hagbergs though. The rain is disrupting the start of our own wheat harvest now, roll on the heat-wave that the forecasters are promising us! Syria are reported to have bought 150,000 MT of Russian milling wheat and Israel to have purchased 55,000 MT of optional origin feed wheat for Oct/Dec shipment. Ukraine's harvest is said to be 97% complete at 36.76 MMT in bunker weight. Wheat accounts for 25.66 MMT (off 97% of plan) of that and barley an additional 9.61 MMT (98%). They've also harvested 1.1 MMT of OSR off 93% of the planned areas. Russia's wheat harvest is reported at 45% done at 49.7 MMT, and barley 42.7% cut at 10.3 MMT. APK Inform say that Ukraine will export 34.7 MMT of grains this season, some 9.3% less than a year ago. Rusagrotrans say that Russia will export 3.0-3.1 MMT of grains in August versus 4.2 MMT a year ago. 09/08/16 -- Soycomplex: Beans closed higher. Private exporters reported to the USDA export sales of 120,000 MT of soybeans for delivery to unknown destinations during the 2016/17 marketing year under the daily reporting system. That's the tenth day of such sales in a row. The trade will now start positioning itself where it wants to be for Friday's upcoming WASDE report from the USDA. The trade is expecting a rise in 2016 US soybean yields to around 47.5-47.6 bu/acre. There's talk that La Nina is on the way, late autumn or early winter (northern hemisphere). 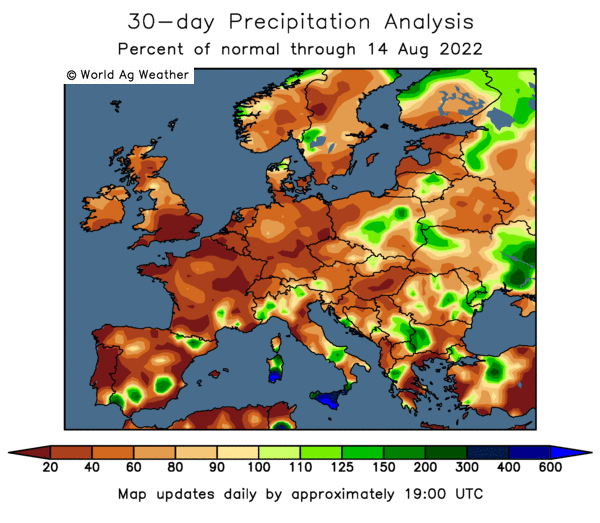 That could mean exceptionally dry planting season for Argentina and Southern Brazil beans. Trade gossip suggests a switching away from beans back into corn there, we shall see. Agroconsult see Brazilian bean plantings up 1.5% for next year. China imported 7.76 MMT of beans in July, up slightly vs. Jun 2014 but 18% lower than a year previously. Year to date imports are still up 3.6% at 46.3 MMT. Aug 16 Soybeans settled at $10.22, up 3 1/4 cents; Nov 16 Soybeans settled at $9.88, up 3 cents; Aug 16 Soybean Meal settled at $339.20, up $1.30; Aug 16 Soybean Oil settled at 31.17, up 24 points. Corn: The market closed around 2-3 cents lower. US weather models show improving moisture prospects for the ECB and upper WCB in the US. The trade is expecting a figure of around 170.5 bu/acre for US corn yields in Friday's WASDE report. Some private trade estimates are reported to be as high as 175 bu/acre. Conab lowered their estimate for this year's Brazilian corn crop from 69.14 MMT to 68.48 MMT, down 19% on last year's 84.67 MMT. They see 2016/17 exports declining to 20 MMT from 30.17 MMT in 2015/16. This should provide a short to medium-term window of opportunity for US corn on the international market. Agroconsult say that current high prices for Brazilian corn will see growers expand plantings by 6% for the 2016/17 harvest however. China tried to sell 2 MMT of domestic corn stocks (from 2012) but met with insipid demand, selling only 14 TMT. They are importing large volumes of US DDGS as a corn alternative. The Ukraine Ag Min estimate their 2016 corn crop at 24 MMT. Sep 16 Corn settled at $3.22 1/4, down 3 cents; Dec 16 Corn settled at $3.32 1/2, down 2 1/4 cents. Wheat: The wheat market closed around unchanged levels. As ever at this time of year Friday's report is thought likely to be more about corn and beans than wheat, but they've surprised us on that one before. 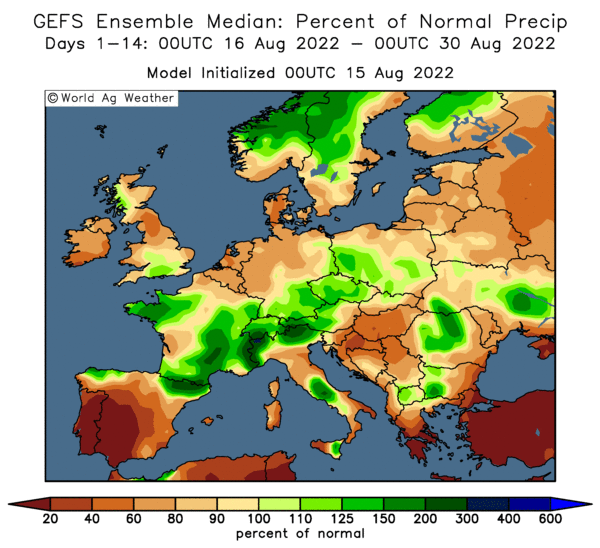 Obviously EU wheat production will be one figure everyone will be looking for given the problems in France this year. Agritel pegged their crop at only 26.68 MMT this year today. The size of EU exports is another imponderable, and who is going to be picking up this business instead. Russia is the obvious candidate, but there's talk of US wheat making it into some traditionally French homes in North Africa this year. Japan are in for 125 TMT of US/Canadian wheat in their regular weekly tender. Wheat prospects in Australia are significantly better than a year ago, say Martell Crop Projections. "Sudden wetness in Eastern Australia may be linked to a weakening El Niño. This may explain recent heavy rainfall in Eastern Australia, particularly New South Wales. As the El Niño steadily weakens, a wet signal from an emerging La Niña emerges. The most productive Australia wheat harvests on record were achieved with a strong La Niña in effect. Very strong La Niña's developed in 2011-12, 2008-09, 1998-99 and 1988-89," they add. Sep 16 CBOT Wheat settled at $4.17, unchanged; Sep 16 KCBT Wheat settled at $4.10, up 1/4 cent; Dec 16 MGEX Wheat settled at $5.07 1/2, unchanged. 09/08/16 -- EU grains finished mixed. 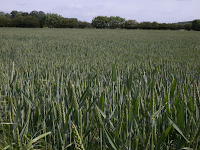 London wheat was higher on the back of a weak sterling. The day ended with Nov 16 London up GBP1.05/tonne at GBP128.05/tonne, Sep 16 Paris wheat was EUR0.50/tonne lower at EUR165.00/tonne, Aug corn was down EUR0.50/tonne at EUR165.00/tonne and Nov 16 rapeseed was up EUR1.75/tonne to EUR371.25/tonne. French analysts Agritel said that the country would fail to top the list of Europe's leading wheat exporting nations for the first time ever in 2016/17. That honuor this season will go to Germany with exports of 6.65 MMT. By contrast French exports will drop 60% to just 5.81 MMT (12.81 MMT in 2015/16). German production will fall, but only from 26.5 MMT to 25.5 MMT, they estimate. French output on the other hand will only muster 28.68 MMT after hitting almost 41 MMT a year ago. Harvest works carry on in the North of France and yields and specific weight remain disappointing, they say. They estimate final yields this year at only 5.48 MT/ha versus 5.57 MT/ha from tha Ag Ministry late last week and 7.92 MT/ha a year ago. The Russian harvest trundles on, at 62.5 MMT off 17.7 million ha (37.4% of plan). Average yields are 3.54 MT/ha against 3.10 MT/ha a year ago. Wheat accounts for 45.7 MMT of that total (42.4%) and barley 9.2 MMT (37.3%). The Ukraine Ag Min said that the country would harvest 60.8 MMT of grains this year (60.0 MMT in 2015), including a corn crop of 24 MMT. The wheat harvest is 97% complete at 25.65 MMT in bunker weight. Yields are pegged at a record 4.25 MT/ha. 08/08/16 -- Soycomplex: Beans closed higher. The USDA reported weekly export inspections of 972,001 MT, an impressive number for this time of year. That is up 44% from last week, and more than five times the amount shipped during the same week a year ago. In addition they reported export sales of 246,000 MT of soybeans for delivery to China during the 2016/17 marketing year under the daily reporting system. That's the 9th trading session in a row of such sales to China/Unknown, also an impressive statistic for August. US weather is mixed. "Hotter temperatures are predicted in the upcoming week, 3-4 F above normal on the majority of Midwest farms. Strong showers are anticipated in Missouri, Illinois, Indiana and Ohio. Most everywhere else in the Midwest less heavy rainfall is expected," say Martell Crop Projections. "Soybeans need rain in August to optimize the yield. The heavier the rainfall the better during the key pod filling stage as wetness increases the size and weight of the beans," they add. After the close the USDA left US soybean crop conditions unchanged at 72% good to excellent (with a 1 point shift into excellent). They said that 91% of the crop is blooming (88% normally) and 69% setting pods (61% typically at this time). 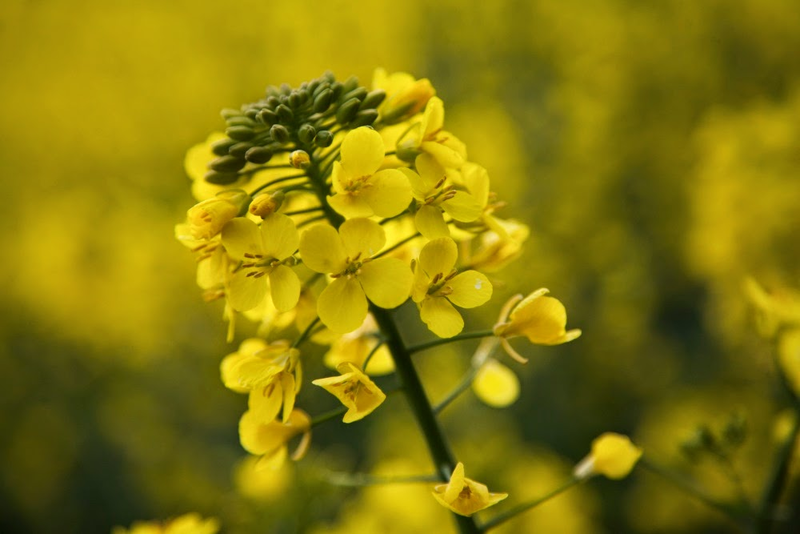 The Canadian wheat board said that Canada exported 10.2 MMT of canola last season (+15%). Strategie Grains said that the EU would need to import 3.3 MMT of rapeseed in 2016/17 (+400 TMT from previously) versus 2.86 MMT in 2015/16. Aug 16 Soybeans settled at $10.18 3/4, up 15 cents; Nov 16 Soybeans settled at $9.85, up 10 1/2 cents; Aug 16 Soybean Meal settled at $337.90, up $2.10; Aug 16 Soybean Oil settled at 30.93, up 41 points. Corn: Corn closed a touch higher. Weekly export inspections of 1.452 MMT were up nearly 27% from the previous week. The USDA reported export sales of 162,569 MT of corn for delivery to Mexico during the 2016/17 marketing year. The situation in Brazil warrants monitoring. Agroconsult estimated Brazil’s drought damaged safrinha crop will lead to 1.5 MMT corn imports by February. The USDA is only factoring in 0.6 MMT for the year at this moment in time. The USDA cut US corn crop conditions two points in the good to excellent category to 74% (70% a year ago). "Vegetation in Midwest crops has deteriorated over the past 4 weeks confirmed by remote satellite. Midwest farmland that was deep blue a month ago indicating a robust crop is now light blue and green . The decline in vegetation is particularly noticeable in Iowa and Minnesota. The patchy yellow and red in eastern Indiana, Michigan and Ohio indicates more severe vegetative stress. Persistent heat and humidity contributed to the downturn in corn. Nights were particularly warm and humid, detrimental for crop development," said Martell Crop Projections. The USDA have 97% of the US crop at the silking stage versus 94% typically at this time, Corn at the dough stage is 53% against 42% on average, The crop is 9% dented (12% on average). Ukraine said that it had exported 2.7 MMT of grains so far this year, of which 438 TMT was corn. Sep 16 Corn settled at $3.25 1/4, up 1 cent; Dec 16 Corn settled at $3.34 3/4, up 1/2 cent. Wheat: Wheat closed narrowly mixed across the three exchanges. Weekly export inspections were only 376,407 MT, just over half the amount reported a week earlier. Not very inspiring. Canada said that they'd exported 40.4 MMT of grains and oilseeds in 2015/16, a 2% rise versus the previous season. Wheat exports were down 7% however at 16.4 MMT faced with strong competition from Europe and the Black Sea. Ukraine said that they'd exported 2.7 MMT of grains in 2016/17 so far, of which 945 TMT was wheat and 1.3 MMT was barley. Russia said that they'd exported 2.19 MMT of grains in the same period (-4.4% in a year ago) of which 1.68 MMT was wheat and 465 TMT was barley. The Russian Ag Min said that the country would produce at least 110 MMT of grains this year. That looks a very safe bet as they've already harvested more than 56 MMT off only 31.5% of the planned area. Planting of winter grains for the 2017 harvest are said to now already be underway in the south of the country. Ukraine's early grains harvest is 93% done at 35 MMT, including 24.4 MMT of wheat off 93% of plan. The USDA said that the 2016 US winter wheat harvest was 94% done (91% typically at this time) and that spring wheat harvesting is 30% complete (18% on average). They left spring wheat crop conditions unchanged at 68% good to excellent. The USDA release their latest world S&D numbers on Friday. The trade will be interested to see what it has to say with regards to European production, exports and stocks this year. These will also have an impact on shipments and carryout elsewhere around the world. Sep 16 CBOT Wheat settled at $4.17, up 1 cent; Sep 16 KCBT Wheat settled at $4.09 3/4, down 2 cents; Dec 16 MGEX Wheat settled at $5.07 1/2, up 2 3/4 cents. 08/08/16 -- EU grains began the week in mostly positive territory, with French woes hanging over the market. The day ended with benchmark Nov 16 GBP0.20/tonne higher at GBP127.205/tonne. Sep 16 Paris wheat traded down EUR1.00/tonne at EUR165.505/tonne, Aug corn was EUR0.50/tonne higher at EUR165.50/tonne and Nov 16 Paris rapeseed was EUR3.25/tonne firmer at EUR369.50/tonne. The French Ag Ministry on Friday joined the bulk of the private trade in now calling for a sub-30 MMT French soft wheat crop this year. The question now is how low will it (finally) go? 28-29 MMT seems to be the range that people are looking at versus 41 MMT a year ago. The Ag Ministry themselves are calling for yields this year to only average 5.57 MT/ha, a near 30% drop on 7.93 MT/ha a year ago. One of the big remaining questions now is how will the UK wheat crop shape up once the harvest gets going in earnest here? Of course, if we end up with 13 MMT or 15 MMT shouldn't really matter in the overall scheme of things globally, but it will make for a hell of a difference psychologically. There's a shortage of rapeseed looming too. Strategie Grains predict that the EU will need to import 3.3 MMT of the oilseed in 2016/17 (without telling us where it is going to come from), up 400 TMT from their previous estimate and 15% more than in 2014/15. Ukraine will only be able to supply a maximum of 1 MMT of that, with their own harvest seemingly capped at 1.2 MMT after a dry autumn cut plantings there last year. Their harvest is currently 91% done at 1.1 MMT. They've also cut 93% of their early grains, producing 24.4 MMT of wheat and 9.3 MMT of barley to date. Russia is 31.5% harvested for a grain crop of over 56 MMT so far. The should be able to cover the bulk of France's wheat shortfall on their own this year. As far as exports go, Ukraine seaports sipped out 372 TMT of wheat to various destinations last week, along with 375 TMT of barley mainly of China and Saudi Arabia and 7 TMT of corn for Lebanon. Russian seaports shipped out 321 TMT of wheat last week to assorted Med desinations, Senegal and the Philippines, along with 65 TMT of barley. Private reports suggest that another 2 panamax cargoes of Romanian wheat are heading for the French port of Dunkirk.